Meadowbrook and Breckenridge Veterinary are full-service small animal clinics that have been serving the pets and their owners of our community since 1977. We strive to provide a welcoming and caring environment for our patients and their caregivers. We continually invest in upgrading our clinical knowledge and technology to make us the best we can be. It is our goal to deliver the best possible care to you and your pet. Dr. Osbourne joined Meadowbrook Veterinary in 1992 after graduating from the College of Veterinary Medicine at Michigan State University. He became a partner in the practice in 1995. Dr. Osbourne was part of the grassroots group of local citizens that helped establish Northville's first dog park. Dr. Osbourne's professional interests include soft tissue and orthopedic surgery, dermatology, and exotics. His latest interest is utilizing the office's ultrasound machine. When not caring for his patients, Dr. Osbourne enjoys spending time with his wife and two sons, or you can find him fly fishing on a secluded river or stream. Dr Jennifer Bartolucci graduated with honors from Michigan State University’s College of Veterinary Medicine in May of 2000. Before joining our team at Breckenridge and Meadowbrook, Dr. Bartolucci has cared for thousands of pets and families across the Metro Detroit area. Dr. Bartolucci is a huge advocate for preventative medicine. Her professional interests also include internal medicine, geriatrics, oncology, soft tissue surgery, and dentistry. As a veterinarian, Dr. Bartolucci enjoys helping to foster the love that is shared and created through the human-animal bond. Outside the clinics, Dr. Bartolucci can be found cheering loudly on the sidelines of her sons’ baseball, football, basketball, and hockey games. Being a mom to two very busy boys and two dogs definitely keeps her on her toes. 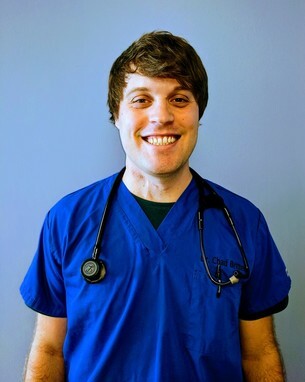 Dr. Brad Boike joined Meadowbrook Veterinary in December of 2018. Prior to joining Meadowbrook, Dr. Boike worked in Emergency Medicine for one and a half years. Dr. Boike is a 2017 graduate of the University of Illinois College of Veterinary Medicine. He is originally from Flushing, Michigan, and did his undergraduate studies at the University of Michigan. Dr. Boike's professional interests include sports medicine and rehabilitation, neurology, and orthopedics. Outside of work, Dr. Boike enjoys being active, watching his favorite sports teams, and spending time with family, friends, and his Rottweiler Briggs. Dr. Chad Britten joined our practice in 2015 after graduating from the Michigan State University College of Veterinary Medicine. Originally from Traverse City, he earned his undergraduate degree in business management from Michigan State as well. Dr. Britten's professional interests include ophthalmology, dentistry, and behavior medicine. In his free time, Dr. Britten stays active by playing basketball. He also enjoys relaxing with his wife while watching a good movie and playing with their cat, Pierogi. Dr. Mary Collisi is a graduate of Michigan State University of Veterinary Medicine and has been practicing veterinary medicine for over 30 years. Dr. Collisi joined Meadowbrook Veterinary in 2000, and has been a dedicated member of our clinics. When not working, she can be found spending time with her husband and family, and tending to one of her passions, her horse farm.